It may be a clue to how house decorating obsessed I am when my boyfriend’s response to me asking him what I could maybe buy on Black Friday, or Cyber Monday, is, “I don’t know, throw pillows?”. 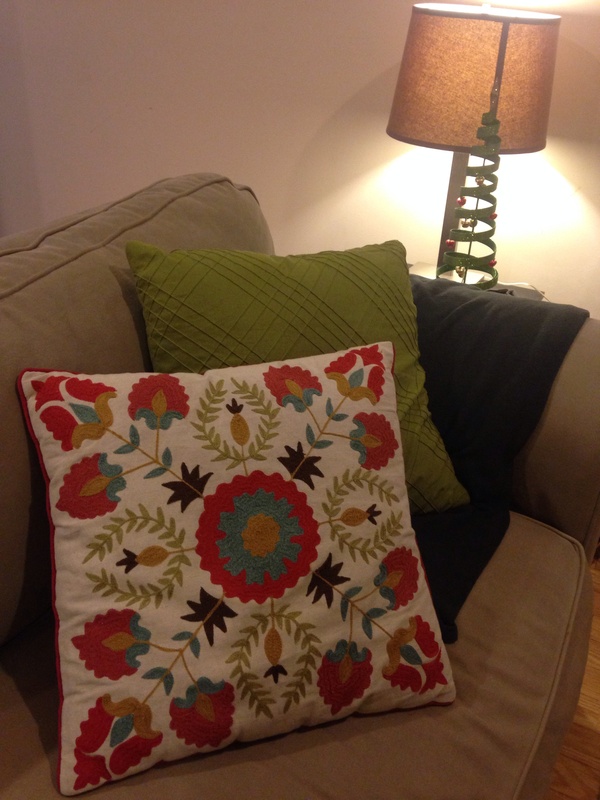 A few weeks ago I found 4 GREAT pillows (one of them being the green one holding up my newest love in the picture above) at Ross Dress for Less (don’t know where I’d be without that store- or what I or my home would be wearing, other than Goodwill) a few weeks ago. And I swear they changed my entire apartment. Well, technically, they kind of did. I live in a studio, so my living room is my apartment 🙂 Anywho, I don’t really need more than those 4- two pillows per couch seems to be enough, but that doesn’t stop me from looking at the throw pillow section when perusing the aisles of Goodwill. And hence finding the above treasure. Unheard of. Pillows like this at boutique shops here in Nashville- exactly like this one- re easily $30-$40. No one will know the difference between my Goodwill one, and those boutique ones. You know, just basing on history and how I act on a daily basis. I’m a proud Goodwill bargain shopper and I want EVERYONE to know it. maybe not the second part, not that, but that does seem to be a by product when I get something for about 90% less than what most people pay.